John Waller [1809-1894] Made popular by Delia Murphy and also recorded by Foster & Allen, Anna McGoldrick, Phil Coulter, Anne Breen and John McDermott, The sheet music and tin whistle notes are included. "Eileen, achara, I hear someone tapping." "Tis the ivy, dear mother, against the glass flapping." "Eily, I surely hear somebody sighihg,"
"Tis the sound, mother dear, of the summer wind dying." [Em]Thrills the sweet[A7] voice of the young maiden[D] singing. "What's that noise that I hear at the window, I wonder?" "Tis the little birds chirpmg the holly bush under." And singing all wrong that old song of 'The Coolun?" We'll rove in the grove while the moon's shining brightly." 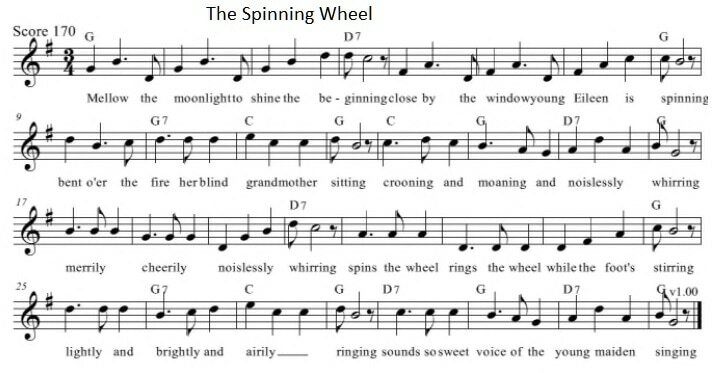 Here's another version of the sheet music for The Spinning Wheel in the key of G Major which is the same as the tin whistle notes.